Kelapo Kept in the Bathroom for Use! Today is World Psoriasis Day, which is very dear to my heart. World Psoriasis Day was established in 2004 by members and non-members of psoriasis associations around the world in order to help raise awareness of psoriasis and psoriatic arthritis. Now you may be thinking, what exactly is psoriasis? According to the International Federation of Psoriasis Associations, psoriasis is a common, chronic, relapsing, immune-mediated, inflammatory disorder with primary involvement of the skin and a strong genetic predisposition. This can leave skin to be red, dry, scaly, and even to the point of bleeding from dry cracks. Some individuals even suffer from psoriatic arthritis, which can be very painful and discomforting. One of my closest family members, my grandmother, was affected by psoriasis for close to 20 years now, so I have always been on a mission to find her anything that could help. After reading about the many benefits of coconut oil and using it myself, I brought her a jar to see if this may be the answer. Coconut oil has anti-inflammatory properties and is also beneficial for adding moisture to dry areas when applied topically, which was great for the redness and scales of her psoriasis. After bringing my grandmother coconut oil, she consistently used it throughout the day and did have good results with reducing dryness. A little coconut oil can go a long way, which was so convenient for her! My grandmother would go through so much lotion from constantly applying something to her skin to reduce the dryness and itch, so this was a lifesaver. 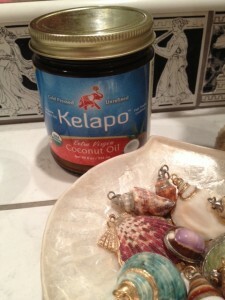 She experienced decreased itching since applying coconut oil to the affected areas, which made her extremely happy. Unfortunately, her psoriasis got so bad that her doctor had to start her on monthly injections, but she has been completely cleared up ever since. She still has scars where all the patches were on her body and dry skin, so coconut oil is still her go-to moisturizer each day. For those of you suffering from psoriasis or if you know someone who does, definitely consider coconut oil and give it a try. For more information about psoriasis and World Psoriasis Day, make sure to visit the website.